Does Whey Protein Raise Cholesterol? The potential benefits of protein shakes include supporting muscle growth and repair, boosting the immune system and the production of enzymes and hormones. Because whey comes from milk, it contains saturated fat and cholesterol. While dietary cholesterol has little effect on your blood cholesterol levels, saturated fat can raise cholesterol. However, preliminary research shows that whey protein may help lower cholesterol levels and reduce levels of another type of potentially dangerous blood fat called triglycerides. Whey protein is unlikely to raise cholesterol, but it may lower it. Whey is a concentrated source of lean protein. In a two-scoop serving, whey provides approximately 30 grams of protein and only 170 calories. It's also low in carbohydrates, with 8 grams per serving. One serving contains 5 grams of natural sugars and no dietary fiber. Whey protein is a low-fat food with only 2.5 grams of fat per serving. Of this, 1.5 grams are saturated fats and the rest are unsaturated. There are also 100 milligrams of cholesterol in a serving of whey protein. It might surprise you to know that the cholesterol you eat in food has little effect on your blood cholesterol levels. Saturated fats, on the other hand, have a greater effect, and eating lots of saturated fats from eggs, bacon, whole milk, cheese and commercially prepared snack foods and baked goods can increase total cholesterol. This can tip the balance between good cholesterol, or HDL, and bad cholesterol, or LDL. However, according to Harvard Health Publishing, the jury is still out on whether saturated fat directly increases your risk for heart disease. Regardless, the amount of saturated fat in a serving of whey protein is not significant. According to the Cleveland Clinic, healthy adults should limit their saturated fat intake to 10 percent of calories. For an average 2,000-calorie diet, that's 20 grams of saturated fat per day. One serving of whey protein would only contribute 10 percent of that total. Researchers of a meta-analysis published in the European Journal of Clinical Nutrition in 2016 reviewed results of 13 studies evaluating the effects of whey protein on total cholesterol, HDL and LDL. They found that whey protein had no effect on total, HDL or LDL cholesterol. However later that same year, a study in the American Journal of Clinical Nutrition found that both whey and casein protein significantly lowered total cholesterol in 38 healthy adults consuming one of the two proteins daily for eight weeks. While preliminary results are mixed and more research is needed to determine whey's effects on cholesterol, both the review of research and the study had one finding in common: Whey protein was effective at lowering triglycerides. Triglycerides are the most abundant fat in the body. Any calories you consume that can't immediately be used for energy are converted to triglycerides by your body, and these are stored in fat cells for later use. Regularly eating more calories than you need leads to weight gain, as well as high blood triglyceride levels. High triglycerides can cause arteries to harden and increase your risk of heart attack and stroke. 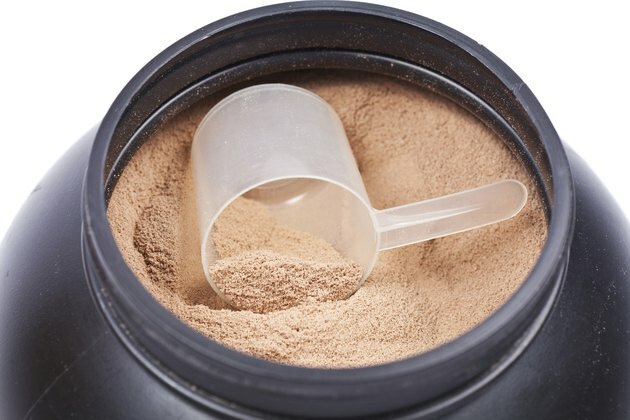 Academy of Nutrition and Dietetics: Protein and the Athlete -- How Much do You Need?